Dibond panels are light, strong and robust, making them very popular as signage and advertising boards where sturdiness and durability is a requirement. Our high quality, high definition printing allow us to produce sharp, stunning colours for any lettering and graphics applied to the Dibond panels and boards so you can make a great impression. Available in a range of colours and finishes, Dibond aluminium composite panels are made of two thin sheets of aluminium laminated on a polyethylene core, making them light, strong and extremely workable. 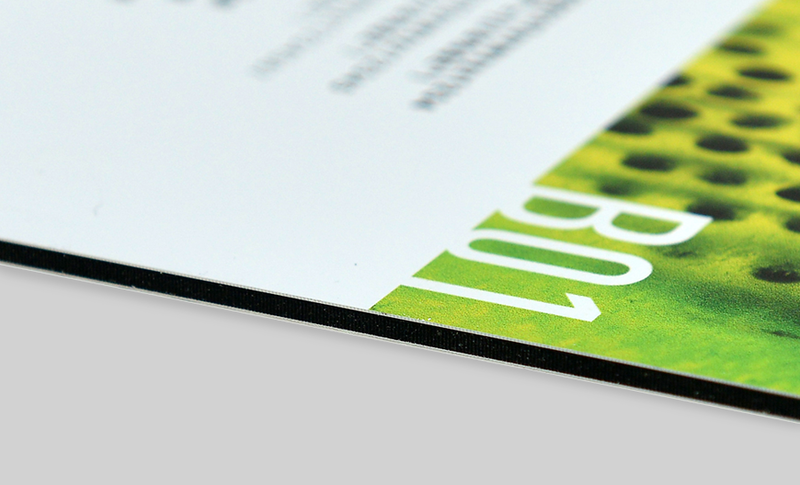 They also have an extremely flat surface which makes them great for printing on high quality graphics or text. The qualities of the boards make them popular to use for temporary structures such booths and stands at exhibitions and trade fairs, and as signage and advertising boards. They can also be used both indoors and out, making them the ideal choice for a whole range of advertising uses. If you wish to design your own signage and advertising please feel free to use the design templates we have available for download. The templates will guide you on the sizing and layout of your designs. Please also view our design formats page to make sure the artwork formats you are using can be accepted for printing. If you would like help with the design of your signage, our professional graphics and marketing team are available. Simply fill out the quote request form or call us at the office and we’ll be happy to discuss just how they can help.